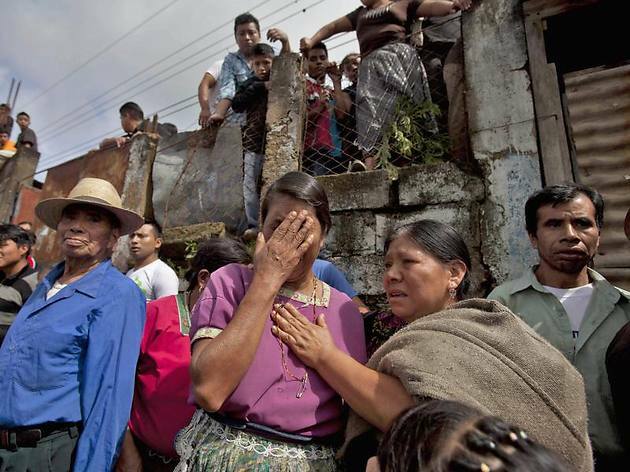 Three days ago a heinous massacre took place in a small town in Guatemala. Under the cover of darkness, a group of men, unknown locally, shot 29 residents in the small town of San José Nacahuil, located 11 kilometres from the northern outskirts of Guatemala City. Eleven people died from gunshot wounds sustained during the vicious attack. The brutal murder of 11 residents shocks the community of San José Nacahuil. Photo by Saul Martinez. Authorities have been quick to associate the attack with gang violence. Some local residents, however, blame the National Civil Police (PNC). Nacahuil employs community police after expelling the PNC in 2005, but on the day in question a PNC patrol car entered the town to investigate an anonymous tip-off about an imminent attack. Police officers visited the cantina of a local businessman and allegedly demanded money from the owner. He refused and the officers left. Shortly afterwards patrons of the eating establishment were met with a spray of bullets. Eight people were killed on the spot and there were more casualties at a nearby bar owned by the same man. Deadly attacks are unfortunately not uncommon in Guatemala. Guatemala has a homicide rate of 38.5 per 100,000 inhabitants, compared to 4.7 in the US and around 1 in most European countries. There is also another angle to this story that the mainstream English language press has been slow to pick up on. Nacahuil is located a few kilometres west of San Pedro Ayampuc and San José del Golfo. Along with residents of Nacahuil, both of these towns have forged a fierce local resistance to the local Tambor mine, which has had a succession of foreign ownership. The Tambor mine is currently owned by U.S.-based Kappes, Cassiday & Associates (KCA), who bought out their former Canadian partners Radius Gold following intense local opposition to the mine. In March 2012, a protest camp, called ‘La Puya,’ was established at the mine entrance. Tensions culminated in June 2012 when an anti-mining community leader was shot and seriously wounded as she left the blockade. Two months later, Radius announced they would sell their share of the mine as part of a corporate strategy “to divest problematic assets.” The protest camp remains in place to this day, calling into question the viability of the mine. 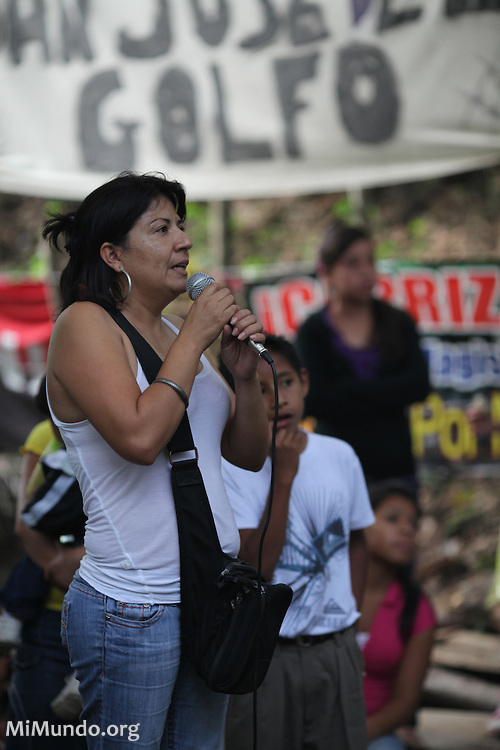 Yolanda Oquely Veliz (pictured) was shot in June 2012 as she left the peaceful resistance camp La Puya. Photo by mimundo.org. At the end of August 2013, activists from La Puya alerted the Human Rights Ombudsman to the unlawful presence of the National Civil Police near the camp, asserting that the patrol cars were working outside of their jurisdiction. They were quick to raise the matter, as police surveillance has in the past preceded more violent acts of repression. Interior Minister Mauricio Lopez Bonilla has reportedly denied any connection between the massacre and the dispute over mining, but local residents remain concerned about the exact role of the National Civil Police in the area. The Guatemalan government has twice declared a state of siege (once in 2012 and also in May 2013) in order to protect the interests of transnational corporations, leaving local communities to speculate how far the current government will go to support foreign business interests. The massacre at Nacahuil comes less than a month before the one year anniversary of the slaughter of 8 indigenous activists by the Guatemalan military in Totonicapán. In Guatemala, the line blurs between those who enforce the law and those who break it. Local residents remain doubtful of the government’s version of events and many possible motives for the cowardly attack are still being considered. Previous PostIndigenous Mexican communities unite for sustainable developmentNext PostRomanians unite to say no to mining!